they grow slowly within the metamorphic rocks and are restricted in by the rock, making larger Emeralds rare and expensive, their resistance to breakage is classified as generally poor. History Egyptian Emeralds were introduced to the world about 4,000 years ago, Cleopatra claimed that the Emerald mines are owned by her, Emerald is Cleopatra's favorite gemstone. She wore beautiful Emerald jewelry, and it is also said that she gives large Emeralds carved with her likeness to the visiting dignitaries when they leave Egypt. The symbolic meaning of the color green was renewal of life and nature. Some people believe that wearing an Emerald brings wisdom, growth, and patience, and for couples they believe that these qualities are essential for long lasting love. Emerald ia a great gift for anniversary or anytime to symbolize love and fidelity. 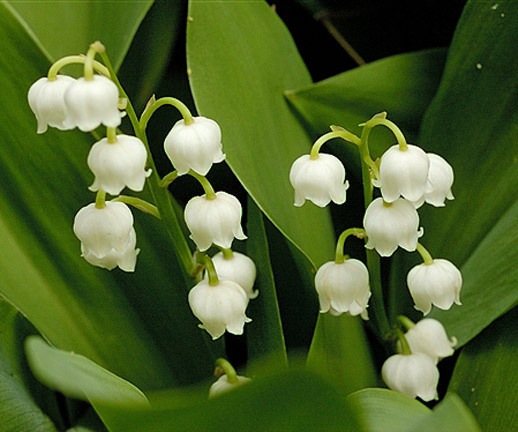 The name "Lily of the Valley" is derived from the latin word maius meaning "May", and anthemon meaning "flower" referring to the flowering time of these plants. Lily of the Valley means Sweetness and Humility, During Victorian Era, The Victorians were strongly restricted when it comes to expressing their love and affection therefore Language of Flowers evolved, A lover could send flowers with a hidden message/meaning. Lily of the Valley are always given for the birth of the new baby and always included in wedding flowers and bouquet.